This article is about Body of water. For the U.S. Naval base, see Guantanamo Bay Naval Base. For the U.S.-operated military prison, see Guantanamo Bay detention camp. For other titular locales and uses, see Guantánamo (disambiguation). The United States first seized Guantánamo Bay and established a naval base there in 1898 during the Spanish–American War in the Battle of Guantánamo Bay:160–163 In 1903, the United States and Cuba signed a lease granting the United States permission to use the land as a coaling and naval station. The lease satisfied the Platt Amendment; this amendment stated a naval base at "certain specific points agreed upon by the President of the United States" was needed to "enable the United States to maintain independence of Cuba." The United States and Cuba signed a treaty in 1934, granting the United States a perpetual lease. Private enterprise is not allowed under the treaty. Guantanamo Bay was used as a processing centre for asylum seekers and a camp for HIV positive refugees in the 1990s. Within six months the USA had interned over 30,000 Haitian refugees in Guantanamo, while another 30,000 fled to the Dominican Republic. Eventually the USA would admit 10,747 of the Haitians to refugee status in the United States. Most of the refugees were housed in a tent city on the re-purposed airstrip that would later be used to house the complex used for the Guantanamo military commissions. 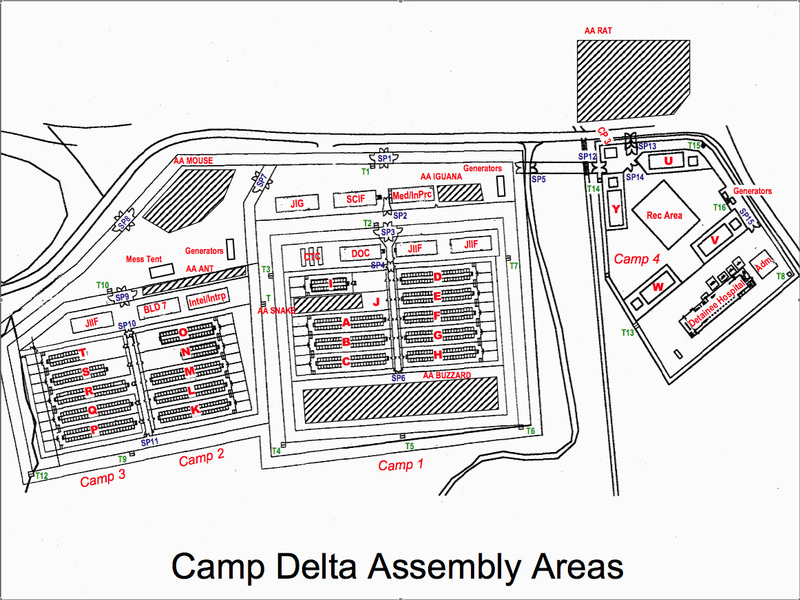 The refugees who represented discipline or security problems were held on the site that would later become Camp XRay, the initial site of the Guantanamo Bay detention camp. In August 1994 rioting broke out in the detention camps in which 20 U.S. military police and 45 Haitians were injured. The naval base, nicknamed "GTMO" or "Gitmo," covers 116 square kilometres (45 sq mi) on the western and eastern banks of the bay. It was established in 1898, when the United States took control of Cuba from Spain following the Spanish–American War. The newly formed American protectorate incorporated the Platt Amendment in the 1901 Cuban Constitution. A perpetual lease for the area around Guantánamo Bay was offered February 23, 1903, from Tomás Estrada Palma, the first President of Cuba. 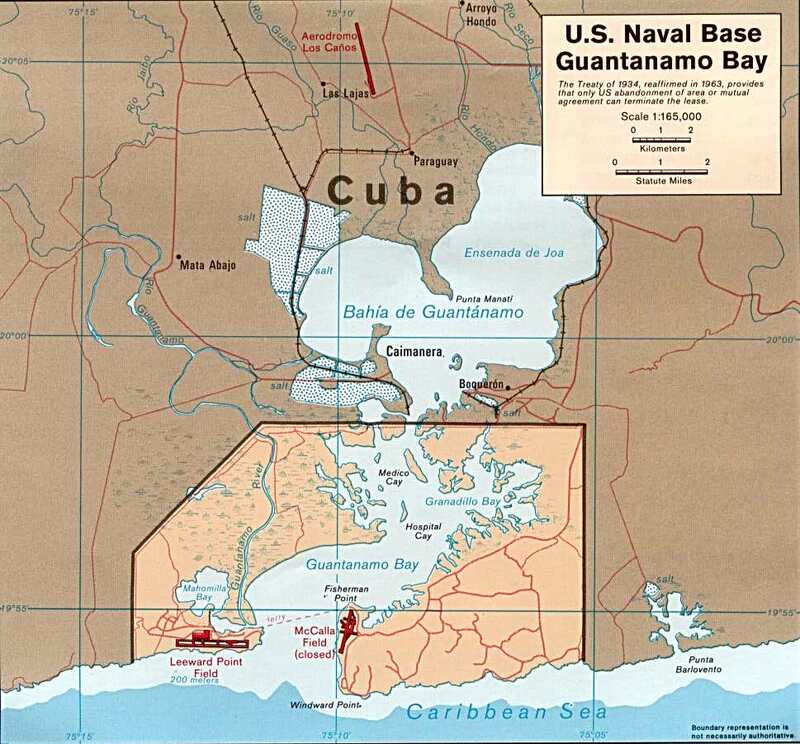 The Cuban–American Treaty held, among other things, that the United States, for the purposes of operating coaling and naval stations, has "complete jurisdiction and control" of the Guantánamo Bay, while the Republic of Cuba is recognized to retain ultimate sovereignty. After the Cuban Revolution, Dwight D. Eisenhower insisted the status of the base remained unchanged, despite Fidel Castro's objections. Since then, the Cuban government has cashed only one of the rent checks from the U.S. government, and even then only because of "confusion" in the early days of the leftist revolution, according to Castro. The remaining un-cashed checks made out to "Treasurer General of the Republic" (a title that ceased to exist after the revolution) are kept in Castro's office stuffed into a desk drawer. This page was last modified on 11 January 2016, at 18:03.